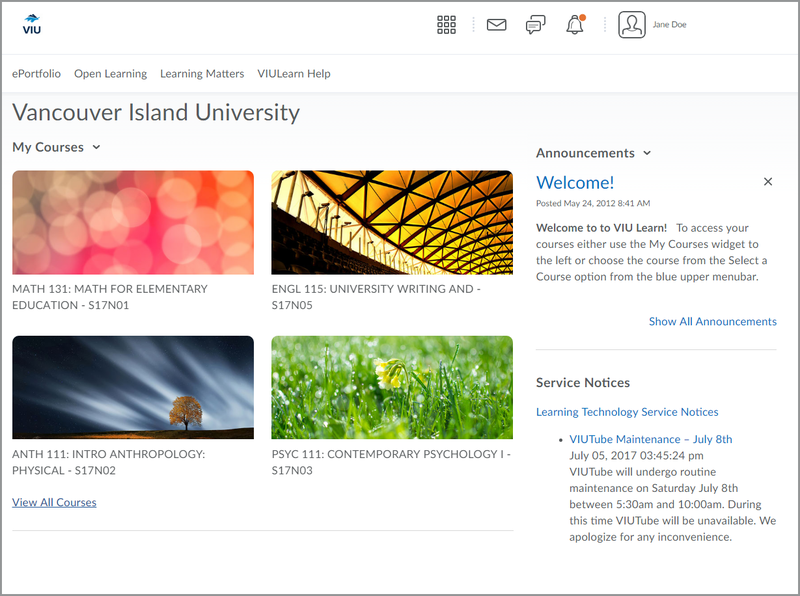 On April 30, Vancouver Island University switched its learning environment, called VIULearn, to the “Daylight Experience” from D2L. Daylight is a change in the look and feel (colours, buttons, icons, text), but it really updates the learning environment to one that is designed to be responsive/resizable to varied screen sizes and mobile devices. Daylight is a game changer because it finally provides students (and faculty) with the same environment regardless of mobile or desktop platforms, while providing consistency, functionality updates from old mobile environment and alignment with today’s modern browsers. The Centre for Innovation and Excellence in Learning facilitated the change after six months of preparation and campus community awareness sessions. This blog post outlines the process and rationale for the timing and changes, along with the results of the change and its impact on the institution. Centre also supports Kaltura cloud-hosted platform (partial integration in Brightspace) for streaming video and storage, Blackboard Collaborate Ultra for web conferencing (full integration in Brightspace), WordPress for blogging/websites and Solar Winds Web Help Desk for tracking tickets, requests etc. The decision to move to Daylight was a relatively easy one. 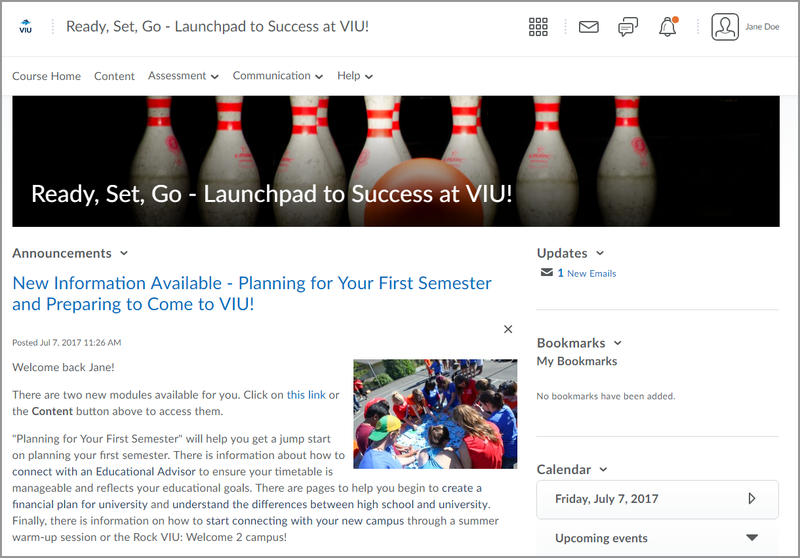 After viewing a couple of webinars from D2L in August and September of 2016, and seeing the plan for moving all customers to the Daylight version, we quickly decided to roll it out at the end of the January to April semester (April 30). Earlier projections from D2L had all customers being automatically put on the new environment by end of 2017. We felt that the April 30 date would be the least disruptive for students and faculty based on our knowledge of exam dates, mark submission time and course end/start dates. In October, we had the Daylight experience put on our Test Instance and immediately starting exploring the changes. We held a meeting of our Learning Technologies Advisory Group (a collection of 30 or so faculty who are fondly called our “super users”) in early November to share Daylight. The response was very positive. The faculty indicated that Daylight involved little impact on the use of the learning environment for users and that students would be benefitting significantly from the new mobile experience. So we stuck with the April 30 date and moved forward with six months of preparation time. Note: While we were keen to have it deployed earlier than April 2017, we needed enough time to recut the most critical of our 80 custom support videos so faculty could have resources that aligned with the new look and feel of the learning environment. October: Built a slide deck with before/after shots using our courses in Test Instance. October: Built a handout to summarize key changes and provide a take-away for posting and sharing with campus. October: Created a little video to show what was meant by “responsive design” and embedded in slide deck. October: Scheduled weekly “Daylight is Coming! Public Awareness Sessions” from November until end of April to ensure we had varied days and times for any campus community member to come see the changes and ask questions. Put all the sessions in our campus professional development registration system calendar tool. In total, we hosted 20 sessions (2 online) with approximately 100 people coming out (about 25% of users). Shared our slide deck and handout. Repeatedly emphasized that there were no “functional changes” in Daylight and that all courses would still function the same, all content would not be lost etc. Throughout November to April: Shared updates with Provost Council (Deans and senior management) so everyone was in the loop. Throughout November to April: Emailed campus community bi-weekly about upcoming Public Awareness Sessions, shared links to blog posts to learn more about the change and invite anyone to ask a question or come see us. February: Presented a “Daylight is Coming!” session for IT Department meeting, focused on support questions they might see. IT Department let us know they’d like to support our Daylight deployment and loaned us one help desk support person for the first week of May. Had support person attend a Public Awareness Session to learn more, trained on our help desk ticket system etc. February: Made decision to also update the Nav Bar, My Home and Course Home. The Nav Bar needed updating due to the wider fonts and changes to padding used in Daylight and our menu items running longer than ideal. We also had faculty requests for other updates. We decide to roll all of the updates also into the Daylight change over. March: Created a survey of the suggested Nav Bar, My Home and Course Home changes and sent out to our Learning Technologies Advisory Group for feedback. Positive responses. Began creating new layouts for deployment April 30. March: We found out that General Availability (GA) version of Daylight would be available in mid-April so we were on track for rolling out the latest version. April: Made a checklist of items to deploy so we could enable Daylight easily on April 30. April 30: 8 am went through checklist of items and changed to Daylight! On Sunday, April 30 Daylight came to VIU! On that first day (according to our search of active users), we had many students and faculty accessing the environment with only a couple of tickets in our help desk system on Monday morning. Most were easily resolved. By 11 am, since there was almost no activity we sent the IT helpdesk person back to their job. There was little reaction to Daylight that whole week (and still now as of time of posting – 2.5 months later). While more of our students and faculty will see the changes in August and September, we did have a good amount of activity happening in May through July to assure us that the move was pretty easy and with relatively little upset by users. At the end of May, we summarized 6 ‘hiccups’ (small issues) we had with Daylight and sent a summary to our Account Manager and Customer Success Manager to share with D2L. Shortly thereafter, we received a consolidated summary on our ‘hiccup’ points. The responses are shared here for the record with some edited responses. (Note: Some of this we originally submitted a ticket for; others we just sent in an email to Daylight Feedback). “Most Recent Version of Safari” in General Availability (GA) – the language D2L used confused Mac users who were unable to upgrade to the version of Safari needed to run Daylight (depended on their iOS – e.g., older iPhones and iPads on Safari 9.x and unable to upgrade to 10.x) or thought they were on the most recent version. Manage Files Freezing – There was a poorly documented issue with the system freezing when items were moved or created in Manage Files. D2L’s Response: Resolved in version 10.7.1. Course Banners Resizing, Cropping or Fading Images – The initial dimensions provided by D2L (1200 x 200) for the course banner did not fit into the space correctly, so we did a bunch of testing and ended up going to Daylight Feedback email. They provided updated banner dimensions to us (1170 x 200). D2L’s Response: We apologize for the confusion here; we did not account for page padding and missed this during testing. Please be aware that we recommend using a larger image, for example 2400 x 960 pixels instead of matching the specific dimensions of the course image banner at maximum size. The course image is used for both the My Courses widget and the course banner and may be used in other designs with different dimensions in the future. Furthermore, the banner and My Courses widget change size depending on the device being used. We hope that future iterations of the course banner will allow users to select a specific crop of an uploaded image, but we do not currently have timelines for this change. Out of Date Browsers Load Daylight Image as a Blank Page: Many folks with older browsers will see a blank page with no message letting them know Daylight will not load in their browser, or letting them know they need to upgrade. Daylight has Removed Ability to Set Specific Font in User Settings: There used to be at least 8-10 font options. Now you can chose the standard font or Open Dyslexic only. This change was never part of the Daylight communications. D2L’s Response: This was a conscious design decision with Daylight made for two main reasons: 1) our design team put a lot of work into creating a great visual experience with Daylight and we wanted the maximum number of users to see and benefit from those changes, including our updated font. 2) we wanted to reduce overhead on our testing teams as we move towards a fully responsive interface. Testing each system font to ensure line wrapping and break points look great on all device combinations is a big overhead; when we reviewed data on how often font preferences are set by individuals we felt that the value of this feature compared to other investments wasn’t there. We wanted to maintain support for the Open Dyslexic font since this was a specific accessibility feature. The course image needs to be saved in the root directory in Manage Files: Although not a big challenge for most faculty, it will present a challenge for some. D2L’s Response: We have triaged this issue and created a defect for it. Unfortunately, the solution for this fix is not straightforward. Given the scope of refactoring required, we are still assessing where this might fit on our release timeline. If this proves a major challenge for your faculty, please raise an incident through support to help us prioritize appropriately. Switching to Daylight Experience for our learning environment was definitely not a ‘big deal’! It was ‘about time’ that D2L did this as the mobile version (especially for student learning) suffered for years and lagged behind other companies. But the switch to Daylight, the work to do it on the day of the switch and the feedback from faculty and students – has really been a piece of cake! Generally, we have a lot of happy users and the system is more current, usable, readable, responsive and definitely consistent with the same platform being used for mobile and desktop. All in all – should have maybe done it earlier if nothing else for student learning and accessibility – but it was planned and communicated and gave the campus 6 months to prepare. Thanks to D2L for all of their support and help through the process! Thanks for posting this! My company is preparing for the forced migration in August 2018. In regard to your section on banner images, do you have any advice or best practices on image selection/creation? I’d like to use our in-house images, but it seems like any time I use an image with people in it, I get a bunch of chopped off heads or weird zoom-ins on noses – even when I follow the 2400×960 recommendation. Thanks! We have a support page on our website to help our Faculty with choosing an image that will work both as the course image and a visually appealing banner. 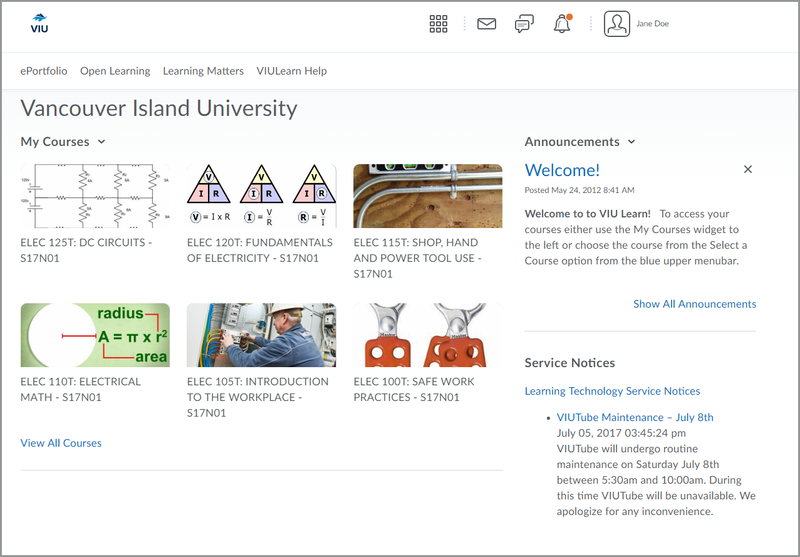 You can view that page are https://ciel.viu.ca/learning-technologies-innovation/viulearn/semester-start-faculty-members/course-image-and-banner. The short answer is that the banner will display the center 2400 x 410 pixels of the full 2400 x 980 course image. With most group pictures of people, the faces will be cut off unless the image is edited to add a margin along the top. If the banner is the most important image for your organization, I would suggest starting with finding an image that works at the 2400 x 410 dimension and then adding or modifying as needed to end up with a 2400 x 980 image to upload.